Without a doubt, the old Dairy Barn on the campus of Central State Hospital in Pineville is one of the most stunning and unique structures in all of Central Louisiana. 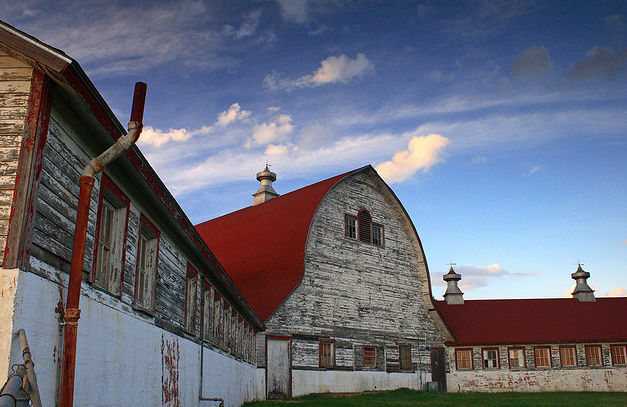 And yet, like so many of our historic buildings, the Dairy Barn is shuttered and hasn’t been in commerce for years. Simple question: In the event that it is restored (it was listed on the National Register of Historic Places over twenty years ago), what should it or could it become? Finally, a beacon of hope! I have, from the first I ever laid eyes on the strucure, wondered how such a magnificent scene could fail to garner any less than an Angry Mob scene in a Vigilante-esque flavor over the sites present condition. Louisiana natives are blessed in abundance with such scenery like no other state in the country. Things that can only be seen in its full glory anywhere else on the globe remain intact here. But this particular scene, in all of its potential perfection, is not the typical Old South flavor normally held in reserve here as in nowhere else on the globe. It is for that reason that this site should have even greater interest shown in our preservation of it. While I can lay no legitimate estimate of how many such sites of this flavor are left, I can say that within my vast travels throughout this countrys highways, that only once have I encountered a similar structure. It was pristine in appearance. Yet, even in its pristinely refurbished state, it still held no candle to this one. Given the Dairy was simply painted -nothing else, just painted- it would provide for Pineville one of the most stunning community gateways to be witnessed anywhere in the United States. Anyone, whether just passing through or residing in the City of Pineville will forever see the little community in a different light. Put a blinding white coat of paint on this structure! The scene will be welcomed in the same vein as the most beautiful Rising Sun to be witnessed. At least, to be fair, as far as our feeble man-made structures can compare to a thing of such magnificence. Dude I have said it for years! If only Pineville would allow alcohol, I would take the Dairy Barn would make the most awesome high-end steak house in the world! That land in front of and around it is just about ideal for a small local winery. Imagine, an upscale fine dining (but not super snooty, or unaffordable) place that grew and made its own wine, in-house microbrew beer, raised organic fruits and veg onsite (Central used to raise all its own food and supposedly the residents greatly enjoyed it), and even grazed its own cattle, pigs, sheep, chicken, rabbit, and ducks and then served all that fresh food and drink literally directly from soil to plate! All while overlooking a beautiful lake with a forest surrounding it. The great thing is that that would actually be enough to bring people here to experience it. Nothing like this exists here in Louisiana. And, the residents of the adjacent hospital could have the added quality of life brought about by doing the farming and such and the satisfaction of seeing the fruits of their labors. Go to Saint Mary’s for mass sometime. Catholic or not, you’ll be wanting to cry and you’ll be inspired because no matter how hard these people’s lives tend to be, they just want things like a job — to be able to go out in life and do something that makes them feel like everyone else. And something like this for the Dairy Barn would not only save that beautiful building, but bring a new attraction to the area, and give the residents of Central such an added quality of life advantage. Can we get some economic development money for something like this? There are several moves afoot to save the structures and have been for a number of years. This is an on going snail’s pace project… Mostly to deaf ears. Find “Ken Roy” and talk to him Lamar. First, thanks for using my photo! To answer your question, I have to agree with the other responses. It would make a killer steak house, but at the very least a little t.l.c. would go along way in serving the Pineville community. Sunsets from that hill overlooking a revamped Lake Buhlow parking lot and pavilion would be awesome! There needs to be a non-profit group formed called “Save the Dairy Barn”, where they would go out to the structure 2 to 4 times a year and paint, fix broken windows, repair loose boards, etc. Maybe the Historical Society up there can start the process. It was also listed on the National Trust’s 10 Most Endangered properties last year. The possibilities for adaptive use are endless. Thanks for all of the comments, everyone. Alex, incidentally, Ken Roy was the inspiration for this post. I had the opportunity to speak with him about his passion for the dairy barn a couple of weeks ago. He has become an outspoken champion for this building, and I am pulling for his vision to become a reality. That said, as I understand it, no one has a clear idea of how- exactly- this building can be reused. If it is donated by the State to a non-profit, they could then sell it to a private-sector developer. And because the building is on the National Register of Historic Places, it qualifies for a 45% tax credit, which I believe should spur some interest. In the meantime, I agree with Ben: A little TLC can go a long way. And by the way Ben, your photos of Central Louisiana are all stunning. Great work. They are all generous gifts to our community. That said, I hope you consider selling a series of signed photos. If people would be interested in purchasing a series of images I can definitely do that. Also, if you know of any establishments that would like to purchase images to hang at their office, business, restaurant, or home, please have them contact me. Thanks again Lamar for your kind comments and any support you can provide. We (HACL) have talked about the Dairy Barn as well. But, you can sit around and talk all day about it..the bottom line is, if the person, or in this case entity, who owns it does not get on board…then all you did was waste your breath. However, we are still advocating for an adaptive reuse. Where do you get 45% from? Are you talking about Federal Tax credits through rehabilitation? That tax credit is 20% for commercial properties. Up to 25% is available to homeowners, it is a residential tax credit. Also, even though a property is on the register, you only receive the 20% credit if it is an income producing property. My house qualified for a 15% tax credit. However, you have to spend $20,000 or more the year you apply in order to receive the credit and you have to make sure they are qualified rehabilitive repairs conforming to National Park Service standards. Also, if your tax liability is not high, or you already receive credits, it may not be worth the trouble. Also, it is not a restoration (many people are confused by this), rather a rehabilitation credit. So, basically that is any dollar you spend making the building habitable (roof, central air and heat, etc). Many people think that all repairs qualify and that is not true. More info on tax credits is at: http://www.crt.state.la.us/hp/tax_incentives_program.aspx I used to be extremely conversant in tax credits, but a few things have changed. The above is the link to the most current information. Also, since this is a Federal incentive program, it always runs the risk of being cut. My advice is if you are going to do the work anyway, to apply, apply, apply for those tax credits! So many people in Cenla do not use them. For homeowners, spending $20k is daunting in and of itself. But, like I said, if you are going to do it anyway, make sure you apply. For the person who works slowly on a property and does not spend over $20k a year, the tax credit is useless. Oh well! I have loved this barn since I was little! Everytime we passed it on our way to Alexandria my mom would tell me the same story. She said that she had read that the barn was an architectural mystery. I wish I could remeber more of the story she would tell, sadly I can not ask her. If anyone knows of the story or if that is true or not please comment!